Our Gastronomic Gulet Cruise In Croatia is one of the 20. Our Cruising the Aegean: A Family Adventure is one of the 50. Our Cruising the Coast of Dalmatia: from Šibenik to Zadar features in both selections. We’re delighted our In the Footsteps of Alexander the Great tour in Turkey is rated one of the 100 best holidays for 2016. The 50 best holidays in Italy. We are very pleased Our Exploring Rome tour is chosen as one of the 50 best holidays in Italy. The top 10 food and drink holidays in Turkey 2016. Our Gastronomic Gulet Cruise is rated one of the top 10 food and drink holidays in Turkey for 2016. The top 10 cultural holidays in Turkey 2016. Our In the Footsteps of Alexander the Great tour is rated one of the top 10 cultural holidays in Turkey for 2016. The top 10 cultural holidays in Greece for 2016. Our tours in Greece are rated one of the top 10 cultural holidays in Greece for 2016, with particular emphasis on our Exploring the Peloponnese tour and our Cruising to the Cyclades. We are very pleased our new archaeological and cultural tour of the Peloponnese was highlighted. We are proud to have been cited as one of the best ways to explore such archaeological sites. Travel article about the stunning world famous Roman mosaics in the villa of Piazza Armerina on Sicily, penned by one of Australia’s most respected travel writers who was on our Exploring Sicily tour in April 2014. We are very pleased that we had two items cited in this top 10 list. Our family gulet cruise is highlighted as ideal for water lovers. Our From the Slopes of Mount Olympus to the Shores of the Aegean tour of northern Greece was highlighted. Our Gastronomic Tour of Sicily is highlighted as one of the best Sicilian food and wine holidays. We’re delighted our Walking and Cruising the Carian Coast trip is rated one of the 100 best holidays for 2015, included in their ‘Journeys: Exceptional Escorted Tours’ section. Our new Walking and Cruising the Carian Coast guet trip in Turkey is highlighted. Our Walking and Cruising the Carian Coast was picked as one of the 10 best new active trips for 2015 / one of the 50 best new trips for 2015. We’re very pleased our Exploring Istanbul tour is highlighted. The top 10 food and drink holidays in Turkey. Terry Richardson offers his selection. Our Gastronomic Gulet Cruise is rated one of the top 10 food and drink holidays in Turkey for 2015. Our From the Slopes of Mt Olympus to the Shores of the Aegean tour was highlighted in the section on Greece. The top 10 cultural holidays in Greece for 2015. Marc Dubin offers his selection. Specialising in cultural/archaeological/culinary tours of Greece (plus Turkey and Italy), Peter Sommer Travels relies on gulets (traditional Aegean motor-sail caiques) for getting around the island bits of their programme. Itineraries are sensibly scheduled for the most pleasant spring or autumn months, and are led by a roster of nearly 30 academic but amiable experts. Among eight Greek itineraries for 2015, we especially like the two-week tours “Exploring the Peloponnese”, touching on well-known and up-and-coming attractions; “Cruising to the Cyclades”, plus several less usual Dodecanese and “From the Slopes of Mt Olympus to the Shores of the Aegean”, taking in the best sites, tastes and wines of the northern mainland and Thasos. Barbara, a highly regarded travel writer and Vice President of the Society of American Travel Writers (SATW) writes about one of our trips. Italy summer holidays guide: art and culture. Our gulet trip along the Amalfi Coast and land-based holidays in Sicily and Rome were highlighted. Our escorted gulet cruises were highlighted. Our gulet cruises in Turkey, Greece and Italy were selected as one of the best sailing cruises. Travel writer Luke Slattery came on our first ever Exploring Sicily tour in April 2014 and wrote a major feature about the trip. Our family gulet cruise on the Lycian coast of Turkey was chosen as one of the five best. Our Gastronomic tour of Sicily featured as one of the 50 best holidays in Italy. Voyages of Discovery: Stand back from that all you can eat buffet and feed your mind instead on an educational cruise. Alessia Horwich picks the best. The list of sights covered on a 15-day Peter Sommer cruise around Turkey’s Carian coast reads like a short course in ancient Greek architecture. Which it is, with gourmet meals, scenic walks, snorkelling stops and no homework… Dr Julian Bennett will provide the specialist information; the remote, unspoilt landscape will do the rest. Our Cruising the Amalfi Coast tour was selected in the Smart Traveller column feature on ‘Archaeological Cruises’. We’re very pleased our gulet holidays in Turkey were highlighted. Pompeii in one perfect day by Anthony Peregrine reveals the smart way to bring it all back to life. Our Cruising the Ceramic gulf gulet cruise was highlighted. We’re thrilled our family gulet cruise in July was chosen as one of the best family adventures in 2013. If you want to sugar the cultural pill, you won’t get much sweeter than this: a bit of classical history and a lot of splashing. On a leisurely gulet cruise down the coast of Turkey, you’ll visit plenty of sites, including the ancient ruins at Patara, birthplace of St. Nicholas, and Simena, with a Lycian necropolis overlooked by an Ottoman castle. Dry stuff? Not when your guide is the youthful archaeologist Michael Metcalfe, a dab hand at bringing the past to life for kids. He’ll have them thrilling to bloodthirsty ancient battles and groaning at dubious classical toilet habits – and the rest of the time they can kayak, snorkel, swim, climb and hold jumping competitions from the boat into the crystal clear water. Luxury family fun: Give the kids the family holiday of a lifetime with a safari in Africa, on a handcrafted Turkish gulet or with a cruise on the Med. We are very pleased our July family gulet cruise was picked as one of the 3 best family holidays. We’re flattered that we were mentioned in the ‘Upper Deck Cruising: Bucket list’ feature in the AFR’s quarterly travel magazine, Sophisticated Traveller. Our Cruising to Ephesus gulet tour was also highlighted. The article talks about Peter Sommer Travels and highlights our Walking and Cruising Western Lycia tour. We’re thrilled that our Cruising the Amalfi Coast trip is included in this list! We’re over the moon that two of our tours are in this list of the 50 best cultural tours for 2013. At number 16 our In the Footsteps of Alexander the Great in Turkey and at 46 our Gastronomic Tour in Sicily. Our northern Dodecanse tour was selected in the Smart Traveller column. We’re delighted our Western Lycia gulet family tour was featured as one of the 20 best family holidays for 2013. Our new Exploring Crete and our In the Footsteps of Alexander the Great tour were highlighted in the ‘Cultural Holidays’ section. High 5 Cruises. Forget floating hotels with shuffleboard and showtunes – here are five cruises to the world’s most beautiful corners, in a style even cruise-adverse will enjoy. We’re delighted our Cruising the Northern Dodecanese was selected as one the five. We were delighted to be featured as the ‘culture experts’ to Turkey, Greece and Italy. ‘Italy’s bay of beauty.’ Jeremy Seal combined a Roman history tour with a cruise on a Turkish gulet along the idyllic Neapolitan riviera in Italy. ”We were on a new cruise taking in world-class sites such a Pompeii, along with the archaeological attractions on islands including Capri and Ischia and visits to idyllic ports, such as Amalfi and Positano…This was top-drawer history tourism…. Jane Reddy in ‘The Frequent Flyer’ interviews our very own Peter Sommer. When asked about his favourite archaeological site, Peter says he would choose Didyma for its sheer power. In their article about “Three Travel Treats”, our Cappadocia tour is recommended. They mention “fascinating historical sites”, “boutique hotels” and a hot air balloon ride. We are pleased to see that Jeremy Seal’s article from the Sunday Telegraph about the Amalfi Coast Tour has been syndicated. He refers to our tours as “Top Drawer Tourism”, with a “Glut of Pleasure” and “True Travelling Pedigree”. Adrian Mourby writes about a Blue Cruise with our guide Serdar Akerdem. He writes: “It’s mid-morning below Bodrum Castle, and already it is hotting up. Light bounces off the sparkling waters of the harbour as the first gulets head into the clear Aegean. A stunning sight…” Peter Sommer Travels is listed as one of the providers of Blue Cruises. “Sail the Med; Five of the best ways”. In their “What’s new?” section, The Guardian mentions our Amalfi Coast and Cappadocia trips. Jeremy Seal writes about his inspiring trip to Cappadocia. Peter Sommer Travels is mentioned as one of the providers of tailor made packages, and our six day cultural tour of the region is recommended. “Immerse yourself in the life of the ancient Romans with an eight-day tour through the Amalfi Coat in southern Italy”. Peter Sommer Travels is mentioned in connection with an article written by our staff member, Heinrich Hall, about why Greece is the place to visit (despite recent problems). They also introduce our “Cruising to the Cyclades” tour, which they say “sounds wonderful”. We received a lovely mention in Lindsay Fulcher’s article Time Travellers focusing on the best tour companies taking travellers back to the legendary sites of antiquity. Jan/Feb issue 2012. Our ‘wide range of cultural, gastronomic and family tours’ were highlighted in the ‘Cultural Holidays’ section. Our two Greece tours, including our Cruising to the Cyclades were highlighted in the ‘Cultural Holidays’ section. “Embark on the Gastronomic Tour of Eastern Sicily for a mouth-watering vacation”. “yacht tours with a cultural flavour, led by expert guides”. Our gulet cruises in the Greek islands were picked out in Chris Deliso’s article A Classical Tale. We were given a mention, with special reference to our Alexander the Great tour in Turkey, in the February newsletter of The Travel Society, a monthly online travel Magazine. Turkey, Greece and Italy in your dreams? Our Cruising the Amalfi Coast gulet cruise was selected as one of the 100 best holidays of 2011. The Benefits of Yacht Cruising by Kristen Bellstrom. Our gulet cruises and tours in Turkey, Greece and Italy were highlighted. Sea of Knowledge. From sunken cities to Roman temples, what could be more romantic than exploring the treasures of the past by boat? Gabriella Le Breton uncovers the best cruises for history buffs. Taking a gulet cruise in Turkey with a tour to Ephesus or a walk along the Lycian Way as possible options was highlighted. Our In the footsteps of Alexander the Great tour in Turkey was selected as one of the world’s ‘Top Ten Learning Retreats’ – having been shortlisted in a 2008 National Geographic book The 100 Best Worldwide Vacations to Enrich Your Life, by Pam Grout. Our three archaeologically themed gulet cruises in the Dodecanese Islands of Greece were highlighted in the ‘Gulet Cruising’ section. 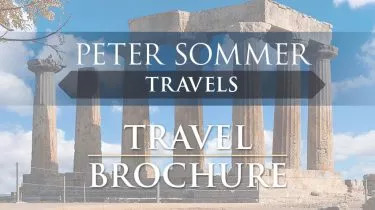 Peter Sommer Travels included in the Cruising section with details of the different tours offered. “savour the offshore breezes by hiring a floating villa: the gulet, Turkey’s delightful small-group cruising schooner, is the perfect way to enjoy this concertina coastline.” Peter Sommer Travels recommended. “Q. My husband and I want to visit Turkey and are interested in the history and archaeology of ancient Troy and Homer’s “Iliad” and “Odyssey.” Any recommendations regarding a reputable agency to book such travel? A. We always thought Iraq was the cradle of civilization, but, no, Turkey also claims the title, with more Greek ruins than Greece, more ancient Roman sites than Italy. The right tour guide can make all the difference in exploring them. “Turkey has many more, and generally much better preserved, ancient sights than Greece. They include both Ephesus and Troy, but also dozens along the southern Lycian coast. Many sites here are little-visited and extremely atmospheric to explore. There is no better way to visit them than on a gulet cruise. These large, wooden motor-sailors ply the coast, stopping in bays, offering excursions ashore, and full board for a week or two with food that is usually excellent. You can visit the sites in the cool of the morning or evening, enjoy deck life, and swim off the side of the boat during the midday heat. Fred Mawer included our land and gulet based archaeological tours in this feature, with our In the Footsteps of Alexander the Great tour in Turkey highlighted. Our In the footsteps of Alexander the Great tour in Turkey trip – “Peter Sommer’s epic archaeological voyage” – was selected in this feature on ‘the trips we can’t wait to take, from the pick of this month’s brochures’. This was my most memorable holiday; a magical historical adventure brought to life by Peter with vivid descriptions and awesome knowledge and enthusiasm for the lives of Greeks and Romans as we climbed and scrambled freely through the ruins of ancient cities, temples, fortresses and tombs on the Lycian coast of Turkey. The Sultan A guests and crew were a delight as well as the most beautiful turquoise and blue secluded bays where we moored and swam. The delicious and bountiful food deserves high praise. Outstanding travel experience. Excellent tour all around. Wonderful guides, boat, crew. Well planned, organized and carried out. A very insightful educational as well as great holiday experience.